Do you know the signs of Foot and Mouth Disease? 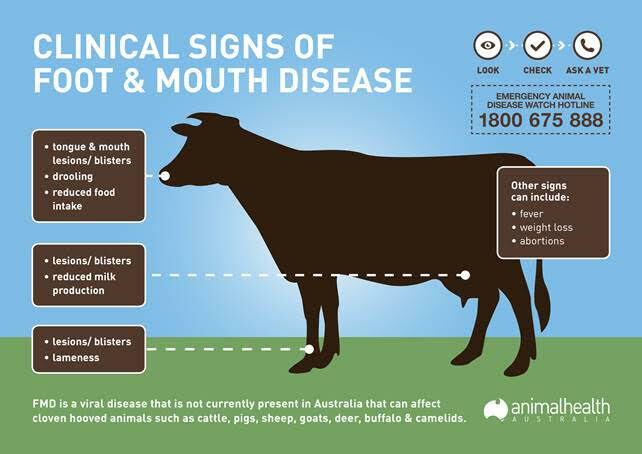 Foot and Mouth Disease (FMD) is known to affect cloven hoofed animals, including cattle, sheep, goats, pigs, deer, buffalo and camelids. Thankfully Australia is lucky enough not to have this highly contagious disease of livestock. In 2013, The Australian Bureau of Agricultural and Resource Economics and Sciences (ABARES) estimated the cost of an outbreak of FMD in Australia. The amount varied considerably depending on the scale of the outbreak. For example, a smaller scale outbreak was estimated to cost approximately $6 billion over 10 years, whereas, a larger multi-state outbreak would cost significantly more – estimated to cost roughly $52 billion over the same time period. Being such a large exporter of agricultural products, most of these costs are made up of revenue losses due to loss of our international markets. The difference between the small and large outbreak scenario comes down to one key factor – early detection of the disease. Without early detection, the disease can spread unrestricted making containment and eradication a much larger job when it is detected. For this reason, it is important that everyone who works with FMD-susceptible species are familiar with the signs of the disease and if anything is found that is unusual that it is reported as quickly as possible. See the figure below for some of the typical signs of FMD. Make sure you have the Emergency Animal Disease Watch Hotline (1800 675 888) somewhere accessible. This number is a 24-hour line where you can report unusual signs of disease in your livestock. If in the case of FMD, every hour can make a difference!